1. Glassblowing at Seneca Glass Factory, Morgantown, W. Va.
Glassblowing at Seneca Glass Factory, Morgantown, W. Va.
Men working inside Seneca Glass Factory. Photography by Richard Phillips, Morgantown, West Virginia. 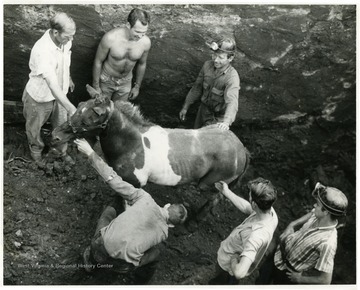 Miners help a pony out of the mine. 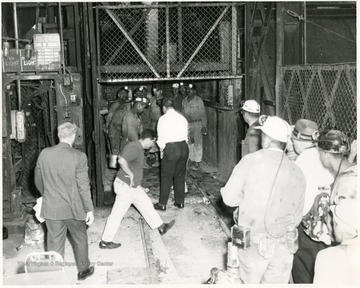 Men leaving an elevator after a mine accident in Monongalia County. 4. 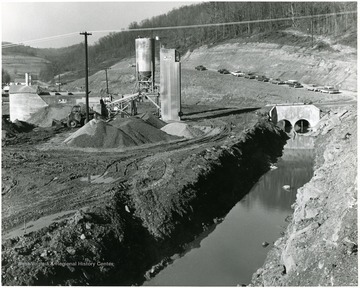 Eastern Coal Company Miracle Run Mine, Monongalia County, W. Va.
Eastern Coal Company Miracle Run Mine, Monongalia County, W. Va.
Miners working with machinery near coal preparation plant. There is a church visible in the background. 5. 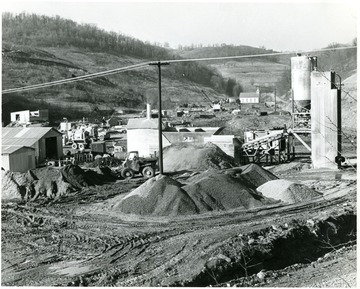 Eastern Coal Company Miracle Run Mine, Monongalia County, W. Va. Stream, coal piles, and buildings at the Eastern Coal Co. 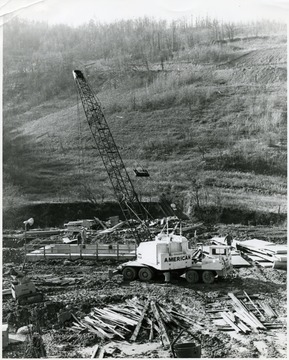 Miracle Run Mine in Monongalia County. 6. 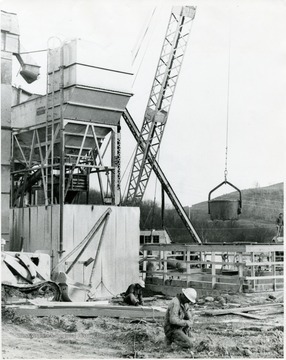 Eastern Coal Company Miracle Run Mine, Monongalia County, W. Va.
Construction of a building at Miracle Run Mine. Two men working with cables while a crane is being used in the background. Coal crushed to 3/16-inch by 0 is pumped to a pulverizer that grinds it to 90-per cent hrough 200-mesh. 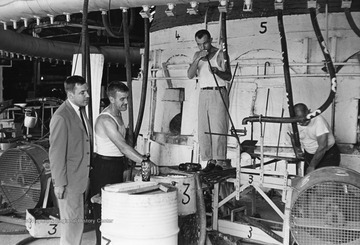 The product is mixed with air and burned in the combustors. 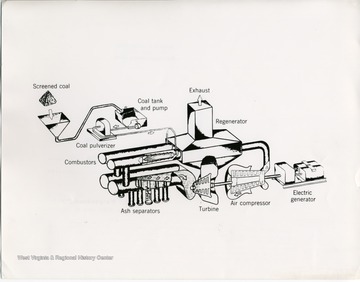 Hot high-speed gas from the ash separators drives the turbine, air compressor, and electric generators. 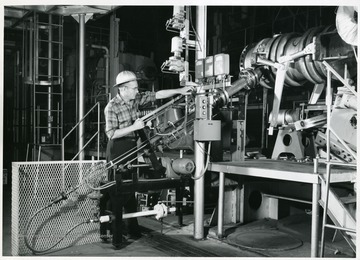 Exhaust from the turbine passes through a regenerator that preheats compressed air to the combustors. If used, please credit Bureau of Mines, U.S. Department of the Interior. 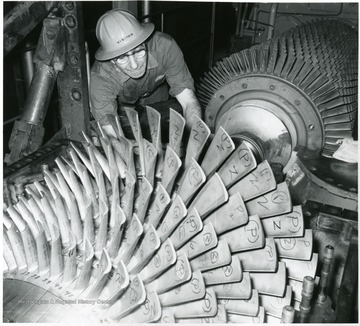 Mechanic working on what appears to be a turbine. C.W. 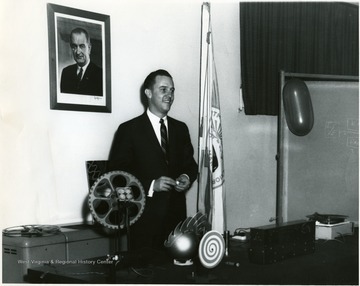 Halstead, C and P Telephone Company, Charleston, W. Va., demonstrates sound transmission on a laser beam at Morgantown Research Center, U.S. Bureau of Mines, Morgantown, W. Va.
12. 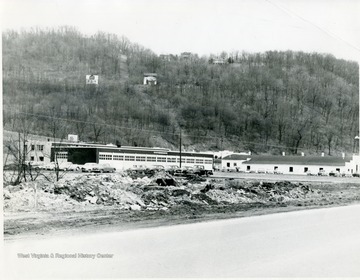 C &amp; P Telephone Company Garage, Sabraton, W. Va.
C &amp; P Telephone Company Garage, Sabraton, W. Va.